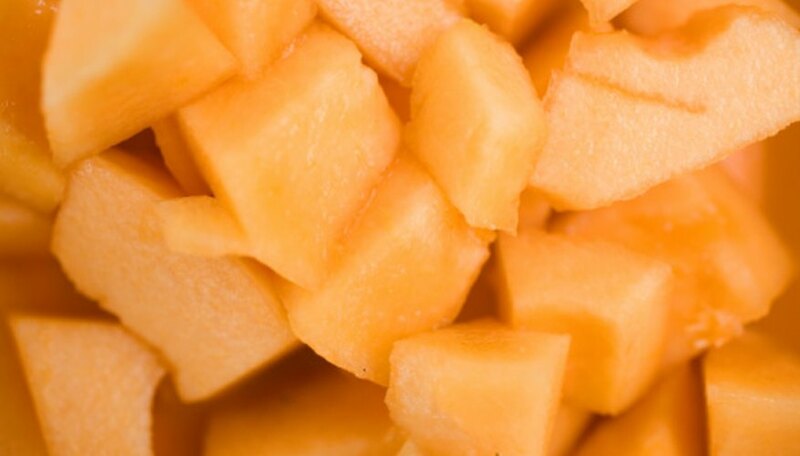 One cantaloupe seed grown under ideal conditions may produce as many as six to eight melons per season. However, cantaloupe requires a long, warm growing season to thrive. In many areas of the U.S., a short growing season nips cantaloupe vines before they produce more than three or four melons. To increase your odds, plant short-season-adapted melons, and keep the soil warm. Cantaloupe need at least 35 to 45 days from flowering to ripen to maturity. They are not tolerant of cold temperatures and germinate when soil temperatures are above 60 degrees Fahreneheit. Start cantaloupe seeds indoors two to four weeks before transplanting, and place them in the garden only after daytime temperatures are reliably above 75 degrees Fahrenheit. Place black plastic over the soil to warm it, which will speed growth and increase yields. Cover young cantaloupe with cloches or floating row covers, especially if temperatures dip. Cantaloupe develop deep roots and need less frequent watering than other garden vegetables. Water deeply at least once a week during dry conditions. Reduce watering as the fruit begins to ripen to improve flavor. Too much water causes a bland flavor. Cantaloupe are heavy feeders and benefit from rich soil. Amend the soil before planting, using compost or nitrogen. Sidedress each plant with 1 to 2 tbsp. of high-nitrogen fertilizer, such as a 34-0-0 formula, when the vines develop runners. Plant varieties well-suited to your area. Choose disease-resistant varieties, such as Classic Hybrid and Hale's Best, if you live in a hot, humid climate. Choose early types, such as Early Hybrid Crenshaw, bush Musketeer and Midget, if you live in a region with a short growing season. These varieties mature several weeks faster than other types, allowing one plant to produce more fruit. Take care not to step on or damage the vines, which will kill any ripening fruit. Harvest cantaloupe when the base color under the netting turns from green to yellow or brown. Ripe cantaloupe have a sweet, musky fragrance that is evident when you walk through the garden. The fruit also slips easily from the vine when it's ripe.